The Manual Payments feature allows you to process credit cards right through your dashboard, as well as record payments collected offline (via checks, cash, and 3rd party payment processors). This feature was designed to be easy to use on mobile devices, so you can easily process payments at events & galas through your smart phone or tablet. With its flexible interface, you can add as much or as little information to the payment record as you need. First, click the "Add a Payment" button and decide whether you want to process a credit/debit card payment through the Flipcause Payment Gateway, or add a payment record for a contribution received offline or through another 3rd party processor. 1. 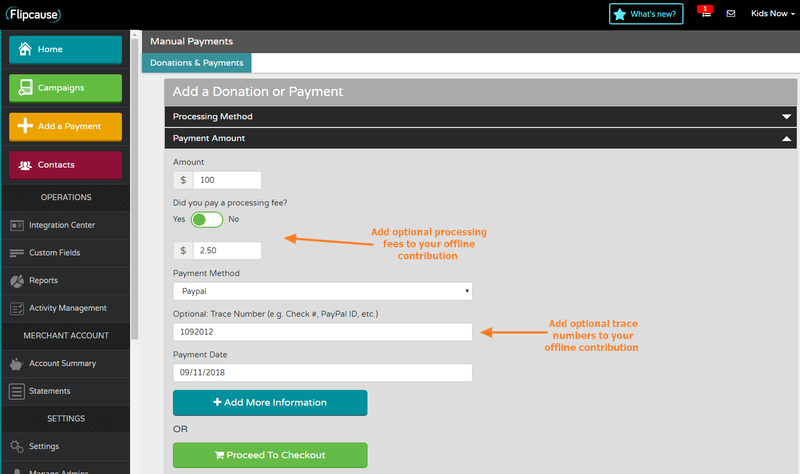 Enter Payment Information: Enter your payment/donation amount and frequency. Here, you can also decide whether the supporter will cover the processing fee and if the initial recurring payment will take place immediately or on a date in the future. Note: The standard processing fee for Manual Payments is 3.5% flat, which includes the credit card fee for all major brands and international cards. Manual Payments are not included in the Guaranteed Effective Rate. 2. Add More Information (Optional): If you'd like to add more information to the transaction record and receipt, click the "Add More Information" button after entering your payment information. All of the fields in this section are optional. Click Add Contact Assignment to lookup contacts in your database. A popup window will open where you can search by Name or Business/Organization. Enter this information and hit Search, then locate the desired Contact Profile in the results and click Select. Note: These steps will associate a payment with an existing Contact ID. 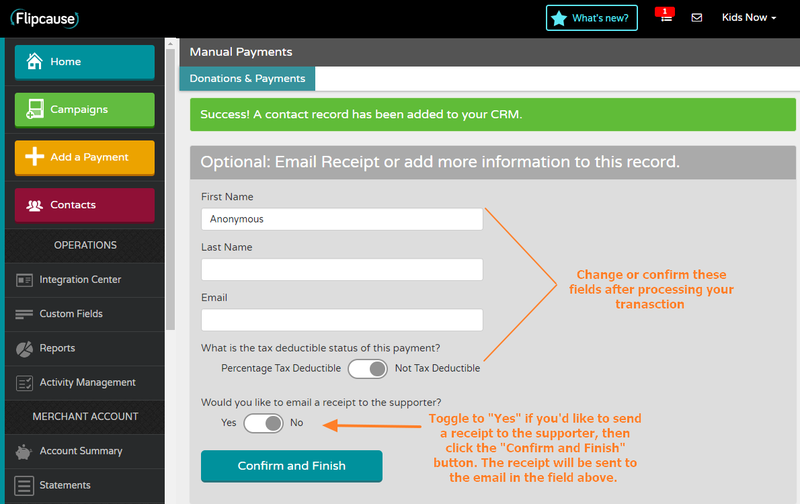 Alternatively, you can also manually add payments from within contact profiles. Use the dropdown menus to select a campaign association. For Peer-to-Peer campaigns, you can also use the Referred by dropdown list to associate the contribution with an individual fundraiser. Advanced Receipt Settings: If you'd like to change default information to be displayed on your receipts, click "Show Advanced Receipt Settings" link under "Additional Information" > "Receipt Info". Here, you can change the logo, organization name, address, and phone number that will be displayed on your receipt. 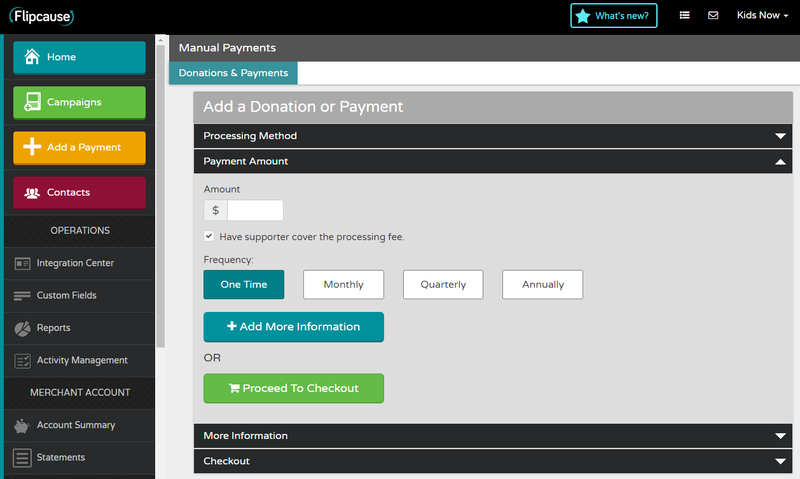 You can also change the Payment descriptor in this section (to read "Donation", "Sponsorship", etc). 3. Checkout: Review your transaction details, and enter credit or debit card information, then click the "Finish" button. 4. Confirm Record and Send Receipt (Optional): As mentioned above, you can change or add information to your payment after the transaction has been completed. The confirmation screen will display the name, email, and tax deductible status of your transaction. 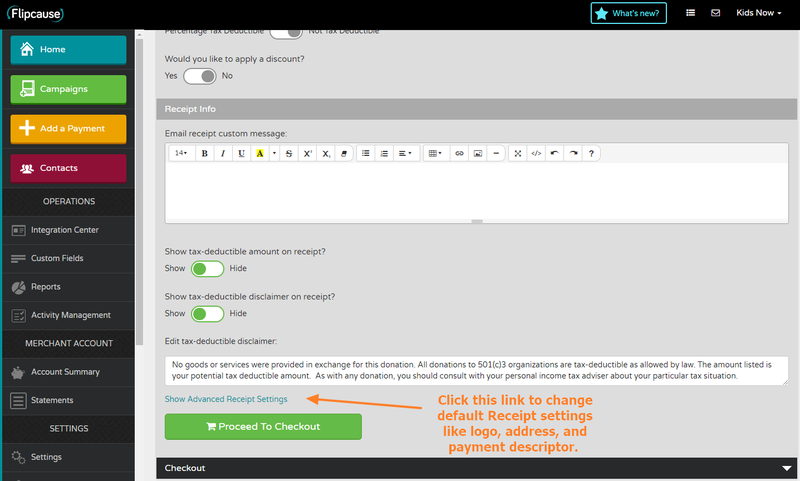 If you have not added Additional Information, these fields will display as "Anonymous" and "Not tax deductible". Make any necessary changes to these fields, and then decide whether or not you'd like to send a receipt to your supporter. 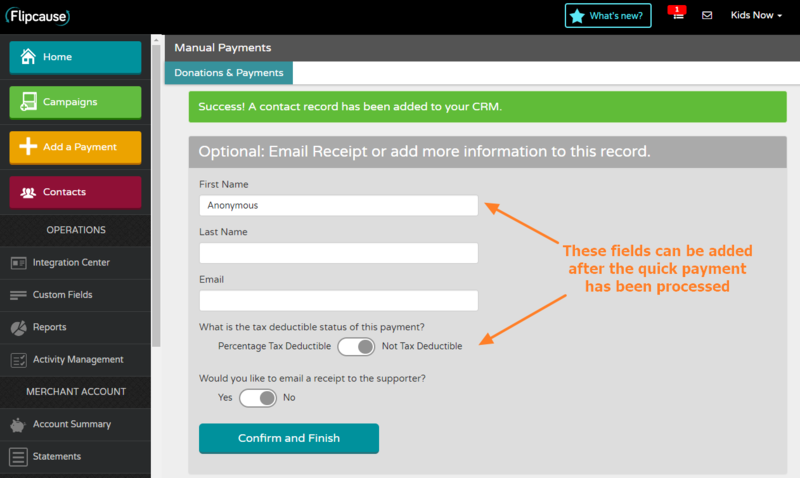 Click "Confirm and Finish" to send the receipt and add the fields to your reporting. 5. Reporting Details: Payments are recorded in your reports with the Transaction Source listed as "Manual Payment - Flipcause Gateway". 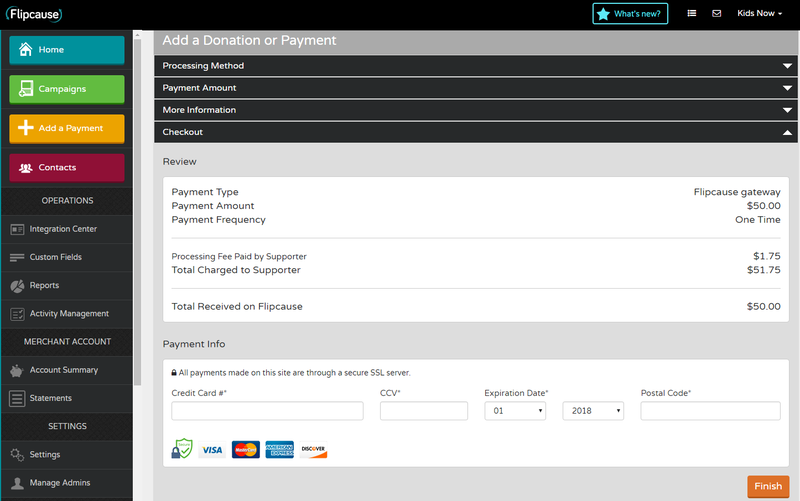 All payment transaction totals (Net Received) are added to your Available Flipcause Account Balance. 1. Enter Payment Information for your Offline Payment: Enter the amount that you received in cash, check, or via a 3rd party payment processor such as Paypal. Select a payment source and payment date (past and future dates are accepted). Add optional details such as check number and whether you paid a processing fee (for recording other 3rd party processors). Note: There is NO processing fee to record Offline Payments. Offline Payment amounts are included in your Total Transaction Amounts and recorded in the "Net Received (Offline)" field, but are not added to your Available Balance. 3. Checkout: Review your transaction details, then click the "Finish" button. 5. Reporting Details: Payments are recorded in your reports with the Transaction Source listed as "Manual Payment - Offline Payment".